Looking for a safety vest that’s tough, lightweight and comfortable even in the hottest or wettest working conditions? Look no further! 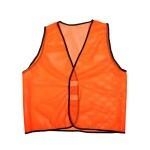 Our mesh safety vests are designed with you in mind. The breathable mesh material is tough enough to handle your day at work, and so lightweight you won’t even notice you’re wearing it! Everyone else will notice though, with a huge range of fluorescent and non flourescent colours, plus a special range with bright reflective tape – so you can be seen day or night. Our mesh safety vests are designed to meet or exceed AS/NZ Standards, with tough, high quality materials, in sizes from XS-10XL. Want your own design? Easy! 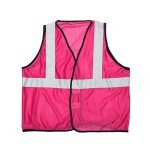 Our mesh safety vests are custom made to order right here in Australia. Buy online and save! With our convenient customisation service, you can add your own design or logo right when you order – no fuss! And our super fast shipping means you’ll have your custom vest delivered right to your door, fast! Breathable Mesh Safety Vest What does a truck driver have in common with a crossing supervisor, or a construction foreman? The answer: They all need the highest quality safety gear.Our breathable m..
Reflective Breathable Mesh Safety Vest Whether you’re running event security or looking for a hi vis vest to wear on your bike, our reflective breathable mesh safety vest gets the job done eve..